Our gorgeous bespoke Adele delicate sparkly crystal wedding necklace is a pretty and delicate bridal jewellery design which sparkles beautifully! 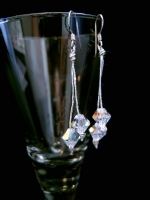 It is handmade with 6mm AB Swarovski crystals all sitting on two strands of delicate, shiny, silver silk thread. 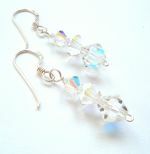 Our Swarovski crystals are dazzling and sparkle much more than this image can illustrate. 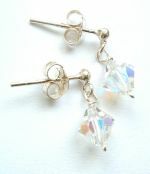 Like this wedding jewellery item but need it in a different colour? No problem, we do offer a bespoke service and can make our Adele bridal necklace in over 50 alternative Swarovski crystal colours, especailly for you. Use our Swarovski Crystal Colour Chart to find the colour that's perfect for you and then select that colour in the dropdown menu when placing your order. The colour used in the image displayed is AB. Adele is approx 16 inches in length and fastens easily with a sterling 925 silver extender chain allowing you an extra 2 inches of adjustment.